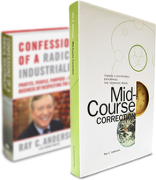 Ray Anderson's 1994 epiphany began when he read The Ecology of Commerce. Here are some other titles we suggest. Welcome to our Book Club. The book that started it all! Hawken's words became Ray's epiphany, and they continue to show that business and industry must take the lead in advancing environmental sustainability. Ray's first book, a comprehensive telling of his spear-in-the-chest epiphany. Now decades old, the book still offers the best vision of what the prototypical company of the 21st century would look like. Ray was indeed a radical industrialist. This book shows why that's a good thing. Ray tells the full business case for sustainability, proving that for Interface, sustainability was so right, so smart. So which technologies really are the best at reversing global warming? Read this book to find out. The good news is that we actually can achieve drawdown, the year-on-year reduction of greenhouse gases in the atmosphere. We just have to scale the best available solutions. Nature is awesome. How awesome? This book will answer that question. Benyus shows her readers just how much better nature is than humans at...well...just about everything. All across the world, people and organizations are dedicating themselves to solving our most pressing environmental and social challenges. Hawken tells their stories, and in doing so, proves that we really can help to heal this planet. This novel will make you think hard about what it means to be human and how we interact with the planet. Does the world belong to humanity, or does humanity belong to the world? And yes, there is a right answer to that question. Biodiversity loss is occurring at an alarming rate today, and we are primary contributors to that problem in surprising ways. Kolbert does a brilliant job of spotlighting how sensitive so many species are to how humans live on the planet. Science! This book is the best we have found at explaining climate change in full, ranging from the physics of how our climate changes to how humanity is driving that change to the policy decisions that could help limit our impact. Esty and Winston provide an easy-to-read and detailed playbook on why it’s smart to make business green, what steps to take, and what pitfalls to avoid along the way. The story of Patagonia and its legendary founder. As seen in this book, Patagonia's corporate values align closely with those of Ray and Interface. A brilliant book exploring "Collaborative Consumption," or what is often called the "Sharing Economy," which will be a significant accelerant to the development of the circular economy. Using the power of philanthropy to spark collective action for carbon neutrality in the university sector.